The bailiffs in fact 'evicted' an empty field. As Cuadrilla, the landowner and the public were made aware, the protesters were always going to leave on 26th August. They did this, having fully cleaned the site after their three-week stay and caused no damage. In the light of this, the decision to incur large legal costs for eviction and to pursue one individual for these looks like a deliberate strategy to deter other protesters. 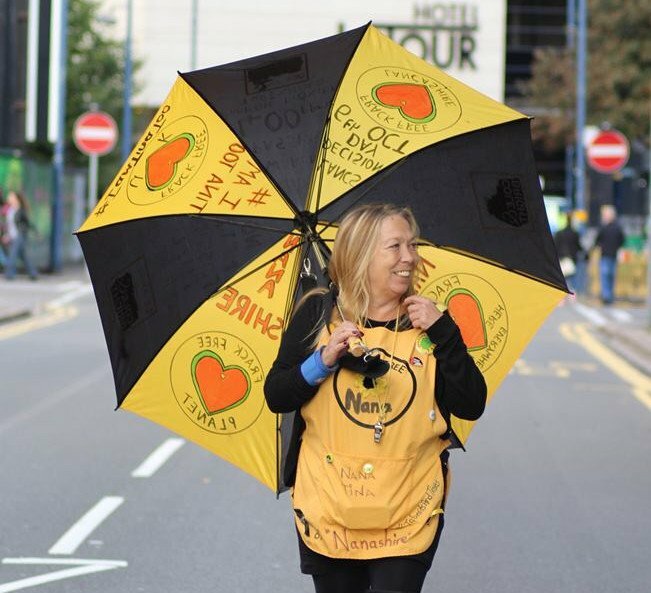 Tina now faces a potential two-week jail sentence for refusing to comply with the Court Order, which she did because she considers Cuadrilla’s case against her to be unjust, bullying and an abuse of perfectly legitimate campaigners to deter protest. The intention to vacate the site was communicated to Cuadrilla and so there was no need for the action you took. Tina has shown extraordinary bravery. When this legal action was brought and a named defendant was needed, she volunteered to prevent one of her fellow Lancashire Nanas, perhaps someone caring for children or elderly parents, being victimised. Tina is an ordinary citizen seeking to exercise her right of protest against an industry which, according to Government opinion polls, is more unpopular than ever because of the risks it poses to our health, to our local and global environment and to our communities. Lancashire County Council supported local people's objections and refused Cuadrilla's application to test-drill, frack and flow-test shale gas wells at two sites. Following an appeal, the Government has decided to overturn one refusal and probably both. You may have won a legal argument, but, as far as we the undersigned and the people of Lancashire are concerned, you have not won a democratic or moral argument. You may have the permission of the Government to frack in Lancashire, but you do not have the permission of the people of Lancashire. Fracking is being imposed on Lancashire against its will. You have described the fracking opportunities in the UK as 'an absolute game-changer'. We agree: fracking could be a game changer -- for the climate. According to Oil Change International, potential carbon emissions from oil, gas, and coal in the world's currently operating fields (without new fracking) and mines would take us beyond 2°C of warming, let alone the 1.5°C which the Paris climate agreement requires us to pursue efforts towards. If we cannot afford to burn the gas we currently have, what is the point of looking for more? We urge you to drop Tina's case, allow peaceful protest and halt the drilling – for all our futures. The steps now being taken to seek payment have been started by your client and it would be possible for them to stop the action by confirming that they no longer seek costs from Ms Rothery and regard this matter as at an end. Plainly the court will not want to engage in pointless further examination of matters if the claimant is no longer seeking ancient legal costs and views the matter as concluded. Given that the purpose behind Cuadrilla's application was to obtain an injunction against a large number of people (it was a persons unknown injunction against potentially hundreds of thousands of people) it appears oppressive to continue to pursue Ms Rothery (and Ms Rothery only) not least when it has already been confirmed to you that she has no funds and nothing whatsoever can be gained by your client. It is hard to see why this enforcement action was started by Cuadrilla (at some expense) and is continuing. In my experience this is out of line with other companies that seek injunctions against protestors. I have never seen a company behave as aggressively and for such a sustained period towards a single protestor on the matter of costs as in this case by Cuadrilla. It is made all the more oppressive when they know that there is nothing to be gained. It is not correct to suggest that this is simply a matter for the court. I have no doubt that the court would not continue to seek information if your client confirmed that they regarded the matter as closed and the debt was no longer being sought from Ms Rothery.